Maine-based musician and composer Timothy Burns has been actively composing music since he was 9. 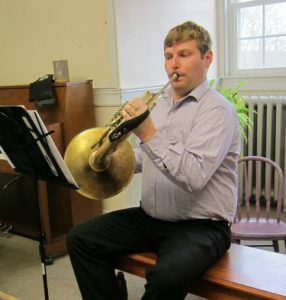 His works are frequently performed throughout northern New England by ensembles such as the Southern Maine Symphony Orchestra, Casco Bay Wind Symphony, and University of Southern Maine Wind Ensemble. Tim holds degrees in music education (BA) and composition (MM) from the University of Southern Maine. His principal teacher has been Dr. Daniel Sonenberg. As a performer, Tim is the founder and conductor of the 207 Wind Orchestra, a professional ensemble which performs several concerts a year in Southern Maine. He is an active free-lance horn player, percussionist, and conductor. Recently he’s begun to study theremin and has always enjoyed playing the recorder. Tim Burns has taught music at Nokomis and Sacopee Valley High Schools and in the South Portland School District. At Mountain Top, Tim teaches French horn, trumpet, and percussion.